September 15, 2018 4:34 pm. 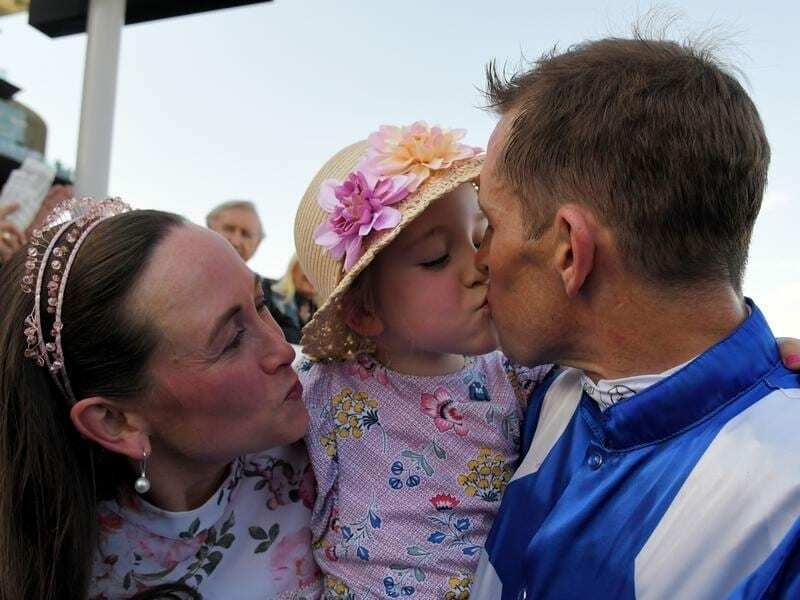 Jockey Hugh Bowman has celebrated Winx’s 20th Group One win with wife Christine and daughter Bambi. Winx has made it look easy as she has done what no other horse has done before – win 20 Group One races. In a carbon copy of most of her races, Winx has skirted the field at the 600m to get in position to launch herself down the straight to claim Saturday’s George Main Stakes (1600m) by four lengths from Le Romain. Her jockey Hugh Bowman admits if he does his job properly, it is as easy as it looks. “I know when I balance her up, I’ve got four or five lengths,” Bowman said. “Le Romain ran a hell of a race and at the corner, I didn’t feel in danger, but I didn’t feel like she was going to be as dominant as she usually is. Le Romain is no slouch and for a moment James McDonald thought he might have done the unthinkable on the $15 second favourite. “I thought I pinched it then I thought Winx is in the race,” he said. The win was Winx’s 27th in a row and also added another string to her bow as her 29th stakes victory to claim an Australasian record previously held by multiple Group One winner Sunline. For her trainer Chris Waller the emotion was once again relief mixed with pride. “If you expect to win races at the 300- metre mark every time you’ll probably come off second-best,” he said. “But Hughey, he knew he had that extra 10 per cent we see every start, it gets her out of a lot of trouble and that’s why this winning sequence continues. Waller would not commit to Winx’s next start heading into a tilt at an unprecedented fourth Cox Plate. “We’ll see how she pulls up. We are thinking about a Cox Plate obviously and the best way to get her there is to take one run at a time,” he said. While her adoring fans clapped her back to scale, there was a new one waiting, Bowman’s four-year-old daughter Bambi on her first visit to the races with her mother Christine and Bowman’s parents. : “Without my family here to enjoy the experience it wouldn’t mean as much,” he said. “She’s brought so much joy to not only those connected with her but far and wide across Australia and the world. “I know it’s a bit repetitive but the amount of people that approach me and just want to talk about her. Waller operates the biggest stable in Sydney and never dreamed of one like Winx. “To have 27 races you have to have quite intense work 27 times, ” he said. “You’ve got to bring a horse to the races 27 times. You’ve got to go home safely 27 times, that’s quite remarkable. “It’s only her exceptional skill that allows it to happen, because it’s impossible what she’s doing.